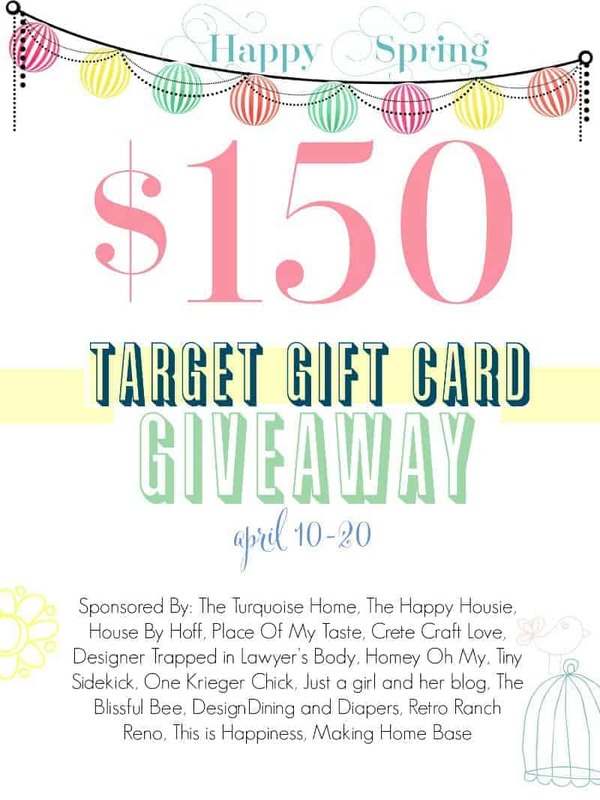 As you can see, I have teamed up with 14 other bloggers to give away a $150 gift card to Target. I mean, who wouldn’t want to win that?? I know I’m personally obsessed with Target – especially since they’ve been rolling out some AMAZING home decor items. Alrighty before we get to the giveaway, lets see what all my other blog friends have been up to! I love the coral mixed in with the yellow and green (and of course with my coral buffet)! If you would like to view my full Spring Home Tour, click here. Alrighty, moving on to the giveaway! Also, remember how I’m celebrating my 2 year blogiversary this week?? Make sure to stop by all of my other giveaways to enter to win!! Favorite Target section would most definitely be the HOME department! SAME here! I’m always so tempted every time I go to the store! Favorite section at Target is the Women’s Clothing one. So pretty! And SO simple! Love this! I love Target’s Home and Women’s departments. Can’t beat their prices on athletic clothes either. Totally agree!! All awesome departments! Yes, their craft section has really expanded lately! No matter what I need from Target, I always have to browse the home decor section. My favorite section at Target is Home! I’ve been in my new house for 3 months and I’m still trying to furnish and accessorize. Target has a lot of cute stuff at a great price so I always check there first. Recently, I’ve been digging the outdoor section of Target. New outdoor pillows and cushions, platters, planters, lights, all with a fresh look to them. Love it. Favorite section is definitely the Home Section! The Home Decor section. OH — and DISHES!!! Those are seriously so CUTE, Amy!! Love them!! Loving the gold, Amy! So excited to be participating in this giveaway with you! Pinning! I love your pretty and elegant eggs, Amy! and I love your blog background!♥ Pinnig:-) Have a great weekend! So pretty and classy, Amy! And the photos are stunning, as always! So happy to be part of this giveaway with you! Love these Amy! Such a cute idea! How gorgeous is this?!?! I LOVE the pinky-coral with the gold dipped ends – so pretty and creative Amy!! I LOVE your gold dipped eggs and seeing all the spring projects! Thanks for hosting this giveaway! The home decor section in Target is my fave but the outdoor and patio section is giving it a run for its money right now! I have to drive over an hour to shop there but always worth it! I am always a fan for the $1 section…with little gifts to buy for birthdays & holidays, it’s a gold mine! My very favorite section is the home decor though, target has really stepped it up & is so affordable! Maybe the cutest eggs ever!! Ooh such beautiful eggs! LOVE the glitter! It was fun being on this “hop” with you, Amy! Have a great weekend! My favorite section is their home department. I love shopping the seasonal section at Target, especially at the end of the season when things go on clearance. Simply stunning! Love the sparkle it adds to your Buffet. Living in a house of boys, I need all the extra sparkle I can get! Have a Happy Day! The home department of Target is my favorite! This post has inspired me to do some Easter egg dying this week – love the glitter eggs! Favorite Target sections is definitely the home section!! !